Do you have a favourite recipe that you think will make this Ramadan one to remember? If so we would love to hear from you. Send all recipes to the Mission Islam Recipe Department and we would be happy to place them here for others to try. We should try to make simple things to eat that won't weigh us down but have some nutritional value. We have received some recipes already - we hope you like them Imsha'Allah .May Allah reward the contributors. Ameen. Please keep them coming and we will try to put up as many as we can and thanks to those who are sending them it is so great to have tried and true new recipes. 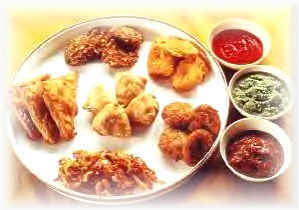 Anas reported that the Messenger of Allah said: "Eat a pre-dawn meal, for there are blessings in it." (Bukhari and Muslim). Prep: 15 min, Cook: 5 min. Combine sweet potatoes and eggs in a bowl. Mix thoroughly and set aside. Sift flour and baking powder together in another bowl. Stir into sweet potato mixture. Stir in melted butter and milk, adding more milk if necessary to create a thick, lumpy sauce which will coat the back of a wooden spoon. Heat a heavy nonstick skillet or griddle over medium high heat to 375°F. When hot, lightly brush surface with oil. Add about 1/4 cup batter per pancake to skillet and cook 2-3 minutes or until small holes appear in batter and bottom is browned. Turn cakes and cook about 1 minute or until browned. Repeat process until all pancakes are cooked. Serve immediately or keep warm in 200°F oven until ready to serve. Serve with sour cream. This recipe serves 6 people. Due to the nature of this recipe, it adjusts the number of servings in multiples of 6 only. Combine apples in a pot. Mix thoroughly and add water and maple syrup if desired or honey. Cook gently, for health reasons I only cook them until just soft as I dont like killing them and making them apple saucy too much. If I can get away with it I will not add maple syrup at all and let my children get use to eating them w/their natural flavor but many a muslimah cannot handle that!! Hehe so for flavoring add what you desire and play around with it. Prep: 2 min, Cook: 5 min.
. try to use honey though stay away from the sugar this month. Prep: 15 min, Cook: 1 hour and 15 min. A cobbler like a pineapple upside down cake. dish, melt the butter in the oven. smooth. Pour batter into the prepared dish. well coated. Drop pineapple mixture by spoonfuls into the batter. 4. Bake 30 minutes in the preheated oven, until golden. 1. Place all ingredients(except pears) into a blender and blend until mixed well. 4. Place glass pan onto a cookie sheet and bake at 350 degrees for 40-45 minutes until lightly brown. Best when served warm. Serve with whipped cream or ice cream. You can also sprinkle some powdered sugar on the top when it is warm. 1. Preheat oven to 350 degrees F/180 degrees C. Grease a 9-inch round cake pan. 2. Clean and core the apples but DO NOT PEEL. Cut apples into 1/2-inch cubes. 3. Place cut up cubed apples in a bowl. Drizzle lemon juice over them and toss to coat. 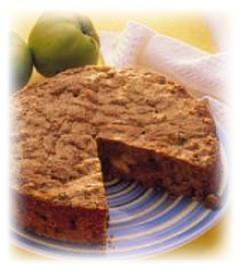 Add raisins, coconut, walnuts, and the 1 tablespoon granulated sugar to the apples. Mix to combine. 4. In another bowl, combine the flour, baking powder, cinnamon, and nutmeg. 5. In a small bowl, combine the eggs and the 3/4 cup sugar. Beat with an electric mixer until slightly thickened and light yellow in color. Beat in the melted butter and almond extract. 6. Make a well in the center of the flour mixture and add the egg mixture. Stir to combine. Add the apple mixture and fold into the batter. Pour the batter into the prepared cake pan. 7. Bake in preheated oven for 45 to 50 minutes, until the cake is golden brown. 8. Transfer cake to a rack to cool. Dust with confectioners' sugar before serving. Serve with a scoop of vanilla ice cream or whipped cream. Yes, these are the little bread balls that go with fish. But they're so good and yummy with other things. Mix together dry ingredients. Add remaining ingredients and mix well. Let batter set about 5 minutes. Drop by spoonfuls in hot oil. Fry until golden. Serve hot. My family enjoys this recipe and is so great during Ramadan. You prepare it the night before and then bake it in the morning. The original version of the recipe came from Joan RIvers' Bed & Breakfast. Cut the bread and cream cheese into cubes. Place half the bread cubes in a lightly greased 9x13 pan. Add cream cheese cubes and top with remainig bread cubes. Beat together remaining ingredients and pour evenly over bread. Give a light sprinkling of additional cinnamon. Cover with plastic wrap and palce in refrigerator overnight. In the morning bake at 375 degree F for 45 minutes. Serve with warm maple syrup mixed with a little cinnamon. This is a make-ahead and bake in the morning for sahoor. Butter one side of bread. Layer bread, buttered side up in a 9x13 pan, then meat, cheese, and mushrooms. Repeat this process again. Mix eggs, dry mustard, and milk and pour evenly over top. Refrigerate overnight. Put buttered cornflake crumbs over top before baking. Bake for 45 minutes at 350 degrees F. Cool 10 minutes before serving. This is one of my most requested recipes. It was given to me by my mother several years ago (though she doesn't usually measure, she did for the sake of her children!) Personally, I've never tasted better. Try it and see for yourself! Heat the chick peas in a saucepan. In a food processor, add beans, tahini, water, salt and garlic. Mix until smooth, about 4 minutes. It should be the consistency of dip; if not, add 1/4 cup of juice from the beans (I almost always add the juice; it's more smooth this way). Then add the olive oil and lemon juice; mix again for 2 minutes. Put in a shallow bowl, sprinkle olive oil and paprika on top, and garnish with fresh parsley and mint leaves. This can be eaten with pita bread, crackers, salad, whatever you'd like; if you want it thicker, omit the ban juice. Add onions, carrots, and celery; cook and stir until onion is tender. Stir in garlic, bay leaf, oregano, and basil; cook for 2 minutes. Stir in lentils, and add water and tomatoes. Bring to a boil. Reduce heat, and simmer for at least 1 hour. When ready to serve stir in spinach, and cook until it wilts. Stir in vinegar, and season to taste with salt and pepper, and more vinegar if desired. Cut both ends of beans. If beans are too long cut in half. Cube onions. Thickly slice tomatoes. Peel garlic cloves and cut into four. Sauté onions and tomatoes in olive oil for 3-4 minutes. Add beans, salt, garlic and sugar and sauté all until beans turn bright green. Add water , bring to boil and cook over medium to low heat until beans are soft. About an hour or a little more. Mix everything except eggplants and olive oil by hand or pressing by spoon. enough pot. Finish with onions. gives off too much juice, they usually do, after they are cooked take them to a bowl. Reduce the juice by boiling gently and pour over vegetables.Serve cold or at room temperature. Slice feta cheese and soak in cold water 1 hour to take the salt out. Then crumble with a fork. Mix with chopped parsley leaves and black pepper. Add 3 eggs and stir well. Melt butter and add flour stirring with a wooden spoon. When bubble starts add warm milk while stirring. Careful not to have lumps! On a low heat simmer to make a thick sauce. Add salt and black pepper. Add eggs one by one , stir well after each egg . Add parmesan, stir well. Grease an oven pan (10" by 14" about) with butter. Put one layer of cooked lasagna. Sprinkle 2 Tb. Sp. of melted butter. Pour 1/2 Tb. Sp. of sauce on 6 or 7 places. Repeat this until you use half of lasagna noodles. Spread the filling evenly. Finish with the rest of the lasagna the same way. Cover the top with the remaining sauce. Decorate with slices of orange colored cheese (optional). Bake at 350 degree F. for an hour or little more until cheese melt and sauce becomes light brown. Let stay about 15 minutes and serve warm. Mix every thing except eggs thoroughly with a wooden spoon. Add eggs and stir well. Don't beat. Heat oil in a frying pan. Put heaping table spoonfuls of mixture in hot oil and flatten to 1/3 " thickness. Fry 4 or 5 at a time. When one side is golden brown turn to fry the other side. Drain excess oil on paper towel. Arrange on a flat serving plate. Serve with garlic yogurt or red onions and lettuce . (optional) Serve warm or cool. Not a joke, this is an actual recipe. My kids went to a Bedouin camp exhibit and everyone got a copy of this recipes (although not everyone got a taste). My translation into English. Who knows, next time you want to have a "different" type of barbeque, why not go for it? 1. Skin, trim and clean camel (once you get over the hump), lamb and chicken. 3. Cook rice until fluffy. 4. Fry nuts until brown and mix with rice. 5. Hard boil eggs and peel. 6. Stuff cooked chickens with hard boiled eggs and rice. 7. Stuff the cooked lamb with stuffed chickens. 9. Stuff the camel with the stuffed lamb and add rest of rice. 10. Broil over large charcoal pit until brown. 11. Spread any remaining rice on large tray and place camel on top of rice. 12. Decorate with boiled eggs and nuts. 1. Wash eggplant and cover with boiling water. Add I tablespoon of the salt and boil 20 minutes. Turn it several times to cook evenly, since it will ride on the top of the water. Drain and rinse in cold water. 2. Peel the eggplant and cut in 1/4-inch cubes. 3. Heat the oil in a skillet and lightly saute the onion. Stir in the eggplant, green pepper, tomato, basil, oregano, remaining V2 tablespoon salt, and pepper. 4. Place in a greased medium casserole, cover with crumbs, and dot with butter. S. Bake in a 350 degree oven about 30 minutes, or until well-browned. Chicken thighs roasted with figs and lemon slices in a lemon, vinegar and brown sugar glaze. Yet it's easy and delicious. Place figs and sliced lemon segments in the bottom of an 11x16 inch baking/roasting dish. Arrange chicken thighs on top, then pour vinegar mixture over chicken. Finally, sprinkle with salt and dried parsley to taste. pan, cook in 2 tablespoons oil. and keep heat low. Add browned meatballs and simmer 30 minutes. Heat the oven to 375 F. To make the spinach-feta cheese filling, drain the spinach and squeeze it dry. In a small bowl, mix crumbled feta cheese and spinach. Sauté the chops in butter so they are brown on both sides. Add the onion, garlic, bay leaf, red pepper and seasoning and cook for 5 minutes. Add 1/4 cup of water and simmer for 10 minutes. Add the green beans and tomatoes. Cover and cook for 1 hour on a medium fire checking occasionally to be sure the lamb mixture is not boiling too rapidly. The beans will be cooked more than we are used to but they will be bathed in the lamb tomato mixture which is divine. In the melted butter sauté the vermicelli, bay leaf, and red pepper until the noodles are golden. Watch carefully and add the garlic so it sautés too. Noodles should be golden. Be careful not to brown. Add the rice and cook for a minute. When ready to serve add the chicken stock and bring to a gentle boil. Cook for 25 minutes. Mix Crisco into salted flour. Put balls into greased pan. Let rise for 1/2 hour. Preheat oven to 350@ F. Combine eggs, corn syrup, sugar, butter and vanilla extract in medium bowl with wire wisk. Stir in pecans. Sprinkle chunks over bottom of crust. Pour pecan mixture into pie shell. Bake for 50 to 55 minutes or until knife inserted 2 inches from center comes out with a little bit of filling attached. If browning too quickly, cover with foil. Cool on wire rack for 2 hours; refrigerate until serving time. makes 8 servings. *If using frozen pie shell, use deep-dish style.do not thaw. Bake on baking sheet. 1. Romove broiler pan with rack from oven. Have a shallow 8 in square baking dish ready. 2. Place eggplant in large bowl; coat all sides with nonstick spray. Sprinkle with salt and pepper. Layer 1/2 on brolier tray. Broil 4 inches from heat 6-8 minutes until lightly browned and tender. Repeat with remaining eggplant. 3. Meanwhile coat a large nonstick skillet with nonstick spray. Heat over medium heat. Add onion; saute 5 minutes until golden. Stir in rest of ingredients except Mint Sauce. 4. Turn oven to 375@ F. Line baking dish with half the eggplant. Top with rice mixture; cover with remaining eggplant. Cover dish and bake 30 minutues until hot. 5. Mint Sauce: Mix ingredients in a bowl; pass at the table. In large pot sauté; the onions, garlic, and ginger in a little olive oil for about 5 minutes. Add the water, lentils, chick peas, white kidney beans, diced tomatoes, carrots, celery, clove, bits of cinnamon, cardamom, cayenne pepper and cumin. Bring to a boil for a few minutes then simmer for 1 to 1 1/2 hours or longer, until the lentils are soft. This is a highly balanced food with protein, minerals, and fiber. Put the lamb, spices, butter, celery, onion, and parsley/cilantro in a large soup pot and stir over a low heat for 5 minutes. Add the tomato pieces, and continue cooking for 10-15 minutes. Salt lightly. Add the juice from the tomatoes, 7 cups of water, and the lentils. Bring to a boil, then reduce heat, partially cover, and simmer for 2 hours. When ready to serve, add the chickpeas and noodles and cook for 5 minutes. Then, with the soup at a steady simmer, stir the lemony eggs into the stock with a long wooden spoon. Continue stirring slowly, to create long egg strands and to thicken the soup. Season to taste. ladle into bowls and dust with cinnamon. Then there's always those little bowls of extra lemon juice for you inveterate sour pusses. Now a little attention to the desserts which plays a very important role in the season, both during the Ramadan fast and also on the day of the great Eid feast. In a large mixing bowl, cream butter with the sugar until fluffy. Add egg and beat well. Add flour mixture alternately with the evaporated milk. 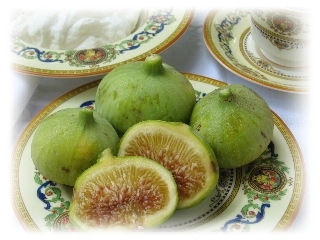 Fold in vanilla and almond extracts and chopped figs. Divide into two prepared 8 inch round cake pans. Bake at 350 degrees F (175 degrees C) for 30 minutes, or until a toothpick inserted into the center comes out dry. Sift together the cake flour, all-purpose flour, and semolina and set aside. Beat the butter for at least 10 minutes until it is fluffy. 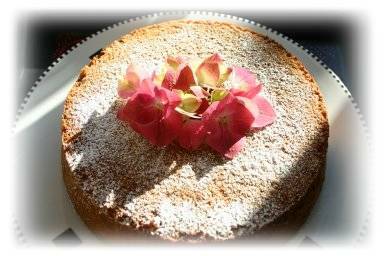 Then beat 2 more minutes while sprinkling in the blossom water and confectioners' sugar. Fold in the flour mixture gradually. Then refrigerate the soft dough in covered bowl for about 10 minutes. With the help of a diamond shaped cookie cutter, shape the dough into 1 inch sided diamonds and place them 1/2 inch apart on an ungreased baking sheet. Then place an almond in the center of each cookie. Bake for 35 to 40 minutes in an oven preheated to around 275 degrees F. Do not overbake. Let the cookies cool for at least an hour. They are best served when cooled for several hours. What I do is fry the onion in a little oil. Then I add the other ingredients and cook until the liquid is absorbed. Then, you just roll it up in the leaves (veined side in) and stack them in a pot with the stems of the parsley on the bottom to lift the leaves and keep them from sticking. Now the rolling is much easier to show than it is to tell…. But here is my best shot. You clip off the stem, and then put a spoon of rice (like a rounded tsp) on the leaf. Then, you start rolling from the bottom where the stem was and you fold the sides in towards the center to make a cylinder shape. The real trick is to vary the rice a little depending on the size of the leaf. If you fill them too much they will burst when you cook them. Also, if the leaf is huge, cut it in half down the middle and make it two rolls. You can also stack them several ways… I tend to do them lying flat and just try to leave as little space between them as possible. I have seen them placed on end in a pot too… But stacking just seems more efficient to me. Then you cover (a little under the top of the stack) with water or broth (one w/o too much salt since the leaves are pretty salty already) and weight it down with a plate. Peel and slice the eggplant (1/2 inch thick) salt it and put it aside for about 3 hours. Cook the ground beef. Set it aside. Put the tomato paste in a little oil and cook it over med high for a few minutes. Then add the sauce and some salt and pepper. Let simmer for about 10 minutes. Now, chop the onion, garlic and bell pepper very fine in a food processor. Add the coriander, set aside. Wash the salt off the eggplant and dry it a little. Now, in a skillet with about an inch of oil, fry the eggplant on med high (depending on your stove) until a little golden, and soft. Set it on a towel to absorb the extra oil. Now, in a baking pan, layer the sauce, eggplant (putting a tsp of the pepper/onion on each slice of eggplant), the ground meat then some sauce. Finish with the sauce on top. Cover and bake in the oven for about 45 minutes on 350. Brown the meat in a skillet with enough oil to cover the bottom. Take the meat out, and fry the onion, pepper and garlic for about 5 minutes. Now add the ingredients all into a bowl and mix them up. Put in a casserole dish and cover. Bake at 350 until the okra is tender (about 45 minutes). If it starts to look dry during cooking, add water. 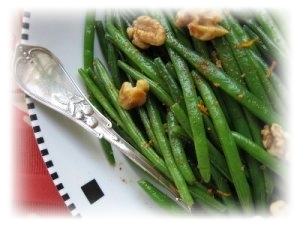 Serve as a side dish for a big dinner or even just put it with rice and salad for a family meal! Wash the carrots, peel them with vegetable peeler. Then cut the carrots vertically quarter of an inch thick circles. Ground three or four cloves of garlic. Mix the garlic and salt with one cup of plain yogurt. Heat olive oil in the frying pan for few minutes. Fry the carrots in the hot olive oil for ten minutes or until brown.Lay the fried carrots on paper towels to drain excess oil. Place the carrots on a plate and dress them with the yogurt, garlic, and salt mixture. This meze could be enjoyed warm or cold. Saute onions and carrots, over medium heat until lightly browned.Add meat and stir until browned. Add 2 cups water, and cook over medium-high heat about 6-7 minutes until meat is tender.Add rice, and heads of garlic into stew.Add rest of the water, do not disturb layering of rice and stew, and boil uncovered until rice absorbs water, for about 45 minutes. When rice is soft reduce heat to minimum, cover pot and let the rice steam 25 more minutes. 1 Preheat oven to 180 degrees C. Brush a deep, 20cm round springform tin with melted butter and line the base and sides with baking paper. Lining must rise at least 5cm above the rim of the tin. 2 Place unsalted butter and vanilla in small bowl of an electric mixer and beat until the butter increases in volume and is a pale yellow colour. Add the sugar and beat until it dissolves and mixture is light and fluffy. Add the eggs one at a time and beat well between each. 3 Transfer the creamed butter and sugar mixture to a large mixing bowl, add the bananas, half the sour cream (reserve the rest), sifted flour, bicarb and spices, and mix with a wooden spoon until just combined. Spoon the mixture into the prepared tin and smooth the surface. 4 Bake for 45-50 minutes or until a skewer comes out clean from the centre. Remove from the oven and spoon the topping onto the cake, spread out evenly and return to the oven for 10 minutes.Turn off the oven, leave door ajar and leave cake inside for another 20 minutes. Remove cake and stand it on a cake cooler until cold. Remove from springform tin and peel away the paper. 5 To make topping: Place the reserved sour cream and the other 300m1 of cream in a medium mixing bowl, add the sugar and vanilla and stir until just combined. 1. Position a rack in the middle of the oven and preheat the oven to 325 degrees. Grease and lightly flour a 9-inch tube pan with 3-1/2-inch sides (or, my preference, use a nonstick pan of the same size but don’t grease and flour it). 2. Resift the flour along with the baking powder, nutmeg, clove, cinnamon and salt into a bowl. Now, resift the flour mixture and then set it aside. 3. In another bowl, using an electric mixer on high speed, beat the butter until it’s soft and very pliant, about 1 minute (or 4 to 6 minutes by hand with a wooden spoon). Gradually add the granulated sugar and beat on high speed until the mixture is pale and fluffy, 3 to 5 minutes (or 6 to 8 minutes by hand). 4. One at a time, add the 4 whole eggs and beat on high speed until the mixture is light and fluffy, about 2 minutes (or 5 minutes by hand). 5. Add the flour mixture to the butter mixture in 3 equal parts, beating on low speed or stirring with the wooden spoon until the batter is smooth and the flour is well combined with the butter mixture. Add the egg yolks and vanilla and continue to beat or stir until they’re well mixed into the batter. 6. Pour the batter into the prepared pan, smoothing the surface. Place on the middle oven rack and bake until a toothpick inserted into the thickest part of the cake comes out clean, about 1 hour (though I’d recommend checking it after 45 minutes). 7. Remove the pan from the oven and let the cake cool in the pan on a wire rack for 10 minutes. If necessary, carefully run a thin knife around the perimeter and the inner rim of the cake to help loosen it from the pan. Invert the pan onto the rack and lift it off of the cake. Turn the cake right side up and let it cool on the rack. 8. Transfer the cake to a serving platter. Using a fine-mesh sieve, dust the top with powdered sugar, if desired. 1. In the refrigerator, soak the chicken overnight in a bowl of cold water covered with plastic. 2. When you are ready to cook, pat dry with paper towels and sprinkle with salt to taste. If the breasts are large, cut them in half with kitchen shears. 3. In a large bowl, combine the flour, cinnamon, ras el hanout and black pepper. Dip each piece of chicken into the flour mixture and shake off the excess. Let the flour dry for 15 minutes. Pour the buttermilk into a large bowl and set aside. 4. In the meantime, pour about 1 inch of peanut oil into a cast iron frying pan and turn the heat to high. When the oil reaches 350 degrees on a deep frying thermometer, adjust the heat to maintain that temperature. 5. Dip half of the chicken pieces in the buttermilk and then into the bowl of flour, shaking off the excess. Carefully place them in the hot oil, skin side down, using tongs if necessary. Fry the chicken until it is light golden brown, turning frequently. 6. Place the chicken skin side down, cover the pan and turn the heat to low. Cook the chicken for 6 minutes, then turn and cook, covered, for another 6 minutes. Remove the top and turn the heat to high. Cook the chicken until it is crispy, about 2 minutes, then turn and cook until the other side is crisp, about 1 minute. 7. Remove the chicken from the pan and drain on several layers of paper towel. Place them on a baking sheet in a 250-degree oven to keep them warm. 8. Repeat steps 5-7 with the remaining chicken. Be sure to bring the temperature of the oil back to 350 degrees before putting the second batch of chicken in the pan. 9. Serve the chicken on a platter with wedges of lemon and small bowls of siracha, the Vietnamese hot sauce, if desired. I like to accompany it with a bowl of cole slaw made from red and green cabbage dressed with a white balsamic vinaigrette. Note: I made Kitty Morse’s recipe for ras el hanout.Siracha, the fiery Vietnamese hot sauce, can be found at most Asian markets.